Last published in 2009, this latest edition of the BCO Guide to Specification has further developed the recommendations for office developments across the UK. New research was commissioned to inform this latest edition of the BCO Specification, covering subjects such as occupier densities and small power consumption. Additions to this Guide are sections on building information modelling, rights to light, planning law and party walls. As with previous editions, it includes the incredibly useful 'Quick guide to key criteria'. It addresses the current drivers for change in the industry, identifying value, the rise of the coffee shop workplace and the growing demand for cycle facilities as the key factors at this time. Place your order now to receive a hard copy of the Guide or to obtain a digital licence. Overseas orders incur additional postage & packing charges. Please call 020 7283 0125 or email mail@BCO.org.uk to discuss options. 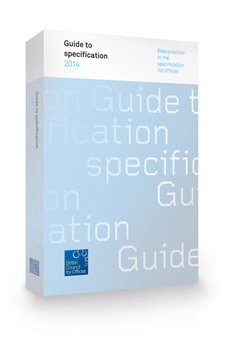 Please note that the Guide to Specification 2014 is a read-only document so it is not available to download or print. It can only be viewed via an online link. It is not available on the BCO Research Portal. Please note: The licence can only be used by the purchaser and while it can be transferred to someone else, it cannot be shared. All 'one user' licences purchased can only be used by the purchaser and cannot be changed. Any licence bought is only valid for 1 year. Renewing your digital licence - 30 days prior to your licence expiring, you will receive an email link to renew your licence at only 20% of the original purchase price for one further year.